Hiro , the Man Who Sailed His House is based on a long form article written by author Michael Paterniti for GQ magazine. When a devastating Tsunami hit Japan in 2011 it carved a wake of destruction through the landscape. One of the miraculous stories of that natural disaster is the tale of Hiromitsu Shinkawa, who was found floating nine miles off the Japanese coast on the roof of his house. Shinkawa thought he was going to die at sea, and had fished a marker pen out of the water and begun writing notes about his life on scraps of paper. 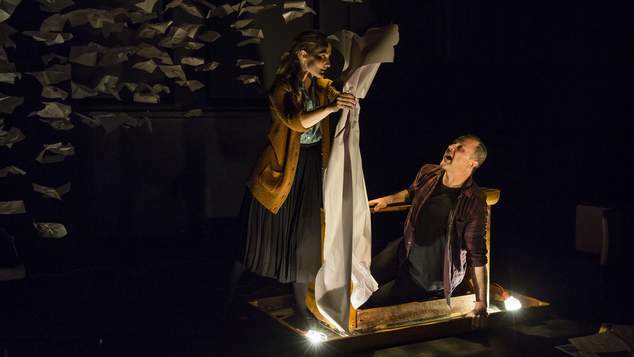 The tale has been dramatised by actor Humphrey Bower and director Samantha Chester, and is performed as a monologue paired with some creative and expressive movement and manipulated objects puppetry. Rhys Morris has designed a stylish and simple set for the action to take place upon, outside in the bar you get your first hint of his styling with a collection of origami boats littered about the bar. Inside scraps of white paper hand from the ceiling in a series of mobiles. The set is simple, a table and chairs, a sheet of butchers paper runs down the middle of the table, a copy of today’s West Australian sits on the table alongside a tea pot. Humphrey Bower sits at the table as Hiro, his wife played by collaborator Kylie Maree brings the tea. Bowler begins telling the tale of Hiro, is powerful and express voice recounting the steps of the man’s daily travels. He has breakfast, reads the paper and heads off to work, there’s a break for lunch, a break for afternoon tea – but then the world is turned upside down and the day does not follow is usual predictable path. The work is a monologue and we’re being told a story rather than seeing a story unfold before our eyes. It’s a technique that on one hand gives a interesting feeling, but it also removes us from the action. Things are described in the second person, a technique Paterniti used in his original article, but it has the effect of making the story distant. Is the hope we would think about what we would do if we found ourselves alone facing a certain death? What would we write in our final notes? Bower is an actor with some impressive skills, but this delivery creates a zen-like atmosphere, where horrific outcomes are delivered like affirmations on a new-age retreat. There has been some effort to turn this into a universal story – Bower is not Japanese, and his character is described as working at a mill, he comes across as a lumberjack. Yet there are Japanese references with tea pots and paper folding through out the work, would it have been more engaging if a Japanese actor had performed the work, I can’t help but wonder. 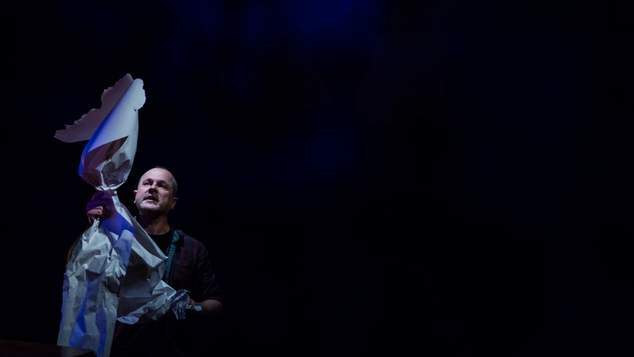 The performance is enhanced by an impressive soundscape and score created by composer Ekrem Eli Phoenix, which helps create a multi-layered experience alongside the impressive set design and Bower’s centred and slowly paced delivery.